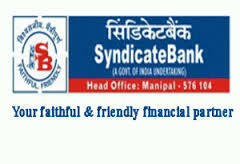 Syndicate bank Offers a 1 year Post Graduate Diploma in Banking and Finance course program for young and bright graduates who fulfill the eligibility criteria specified and who are interested in a Banking career. The course will be held in Manipal Global Education Services Pvt Ltd. Bangalore (MaGE) and Nitte Education International Pvt Ltd. Greater Noida (NEIPL).On successful completion of the course within the stipulated time period, the candidate would be offered appointment in the bank as Probationary Officers in Junior Management Grade / Scale-I. Date of Online test(Tentative): 07.02.2016.